The withdrawal of Soviet aid in 1990 left Cuba’s economy on a knife-edge. Cubans lost all their markets in sugar. They ceased to receive foodstuffs, fuel, wood, soap, raw materials. Calories and protein intake were reduced by half. Plans for nuclear energy had to be abandoned. The US intensified its blockade, passing the Helms-Burton Act. It was a case of adapt or die. No one expects Brexit to be like this, but we will need to be more self-reliant – and self-reliance would be good for Britain. For Cuba, it became an absolute necessity. Small parcels of land were set aside for family gardening. City spaces were utilised for the production, hydroponically, of three million tons of vegetables a year. This gave jobs to 300,000 citizens. Using straw and other agricultural waste and employing drip irrigation or micro-jets, they achieved this without emitting a gram of carbon dioxide. Marxism-Leninism was the theory which enabled Castro to apply his natural intelligence to any seemingly impossible situation. In a matter of five years, under his leadership, Cuba’s economy was turned around. The world saw a nation unbowed in the face of adversity. The revolution was saved. With Brexit a new generation will need to learn how to manage and control Britain’s assets. Dependence on EU institutions has severed the pathways of understanding, the chain of knowledge – theory and practice – passed on from generation to generation. The economics of running the country in the interest of our children cannot be left to sclerotic bourgeois old politicians. New questions have arisen demanding scientific answers: efficiency versus the environment, GM crops and herbicides, for example. In Cuba the answers have been guided by scientific research, not the prejudices of politicians. After the thinking comes the planning. 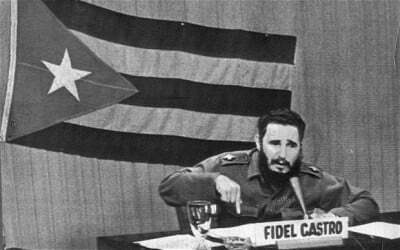 Castro said of the revolution that it would “establish all necessary controls. We are not a capitalist country, where everything is left to chance”. Planning was the key, and young Cubans were encouraged to become fully involved, as they are to this day. Their Youth Labour Army was crucial to successful agrarian reform, building railways, schools and houses in areas short of labour. Castro put the young Che Guevara in charge of industry and economics, “not because he had a degree in it, but because he had read a great deal and observed a great deal”. Che argued for voluntary labour. He led by example, in fields and mines, on building sites and in the docks. At the time of the revolution in 1959 the nation was bankrupt, its assets stolen and sent abroad. The revolution was initially slow to react, with the result that the US was able to freeze millions of dollars that had not been taken out of banks. Nationalising banks, nickel, oil and sugar refineries was essential to develop and protect the nation. But Cuba did not go down the road of forced collectivisation. Cuban sugar cane farmers had started the first war of independence in 1868 by freeing slaves, who joined with their masters in the war against Spanish colonialism. Descended from farming stock himself, Castro recommended leaving small farmers to run their own businesses, but foreign expropriators were duly expelled. Only the big landowners were nationalised, with compensation. This approach was sensitive, and not entirely economical, compared with that of the USSR, but Castro’s concern was unity – the avoidance of the trauma of loss, and of bureaucracy and “gigantism”. There was the flexibility for farming co-operatives to emerge out of efficient state enterprises, and for these small independent farmers to provide electrical power, water, schools and health services. Free to determine its own policies, and led by highly qualified scientists and experts in renewables, Cubans have invested in an Energy Revolution – out of necessity rather than environmental concerns (though they care about the planet too). Hurricanes, a world economic crisis, shortage of imported oil, and outdated power plants have all compelled them to decentralise electricity in favour of smaller distributed units. Clean energy has been brought to Cuban homes through the free circulation of modern appliances, including fridges. Cuba was the first to transition from incandescent bulbs to fluorescent lamps. And all on the basis of social equity – poorer households pay less, or even nothing. Solar panels, which are economical to buy and maintain, have brought electricity to rural areas for heating and drying. Cuba is a country of contrasts – relatively temperate in the west, hot and arid in the east. Consideration for the whole country and its varying needs has contributed to unity and mass support for the revolution. Wind energy is exploited within its limitations. Like in Britain, the traditional burning of fossil fuels still plays the major part in energy supply but only until new technology, carbon capture, or nuclear supply can replace it. The point for both countries is that when that day comes, the people are sufficiently in charge to be able to grasp the opportunities. Cuba’s fishing industry is a similar mixture, on a smaller scale, of state-owned and independent, all-family concerns, with many communities dependent on shrimp for a livelihood. Trawlers are often past their sell-by date, and the seas have suffered from over-fishing. Some 40 per cent of the big fish have simply gone. But the coral reef is still pristine, and steps are being taken to develop fishery co-operatives to improve food security and biodiversity alongside production. It is a striking feature of Cuba’s socialist planned economy that out of work fishermen are not simply left to languish, as in Britain – the state takes responsibility for identifying alternative livelihoods for them. If nothing else, the world knows about Cuba’s great achievements in the sphere of education and medicine – its pioneering work on meningitis, hepatitis, and molecular immunology. Experts in Britain marvel at the success of Cuba’s literacy programme, and lifelong learning delivered free to all. In recent years the training of computer programmers and designers has been seriously promoted and IT has become an integral part of universities and youth clubs. Further education is seen as a way out of crime. Courses have been taken into prisons. Public health study centres have been set up in polyclinics, health units and blood banks. Excluding universities, 600,000 Cubans work either as students or teachers. It is an interconnected approach: 100,000 teachers of higher education formerly worked in sugar cane centrales. If for any reason workers have to be laid off their salaries are still paid so they can return to education (this is voluntary). When it was seen that the children were outstripping their disadvantaged parents from the barrios, grants were provided for the over-45s too. “They are going to be among the most revolutionary of our citizens, because these programmes represent a rebirth for them,” said Castro. Art, music, dance, drama and sports all get state support in Cuba. In Britain by contrast there is an ideological attack on education and on our health service. We import health workers at ridiculous cost to the NHS, while tiny Cuba trains enough of its own and to spare. Within Cuba’s sphere of influence doctors share their skill and knowledge, and students from developing countries can attend training in Cuba free of charge. Infant mortality stands at 49 per 1,000 live births worldwide: in Cuba (according to the CIA’s World Factbook, no less) it is a mere 4.5 – lower than the USA. Unicef says 700,000 children could be saved annually if the world copied Cuba. Attempts to destabilise and isolate Cuba continue, but Cuba is safe so long as the people stand by their revolution. We can be sure that if Britain is successful in re-establishing national sovereignty, we and others will be punished for trying. Our answer must be to stand together, at home and abroad, against the false internationalism of the EU.